Waterbury Clock Co. "Gallery", ca1893. This is a large early gallery case, without the 8 day movement. 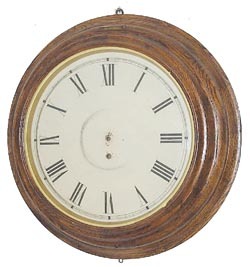 Large 18 inch dial is painted on zinc. Great old oak case is constructed of 4 layers of oak. Front lifts up, hinged at the top, to access the pendulum and hands. Labels on the back. Case needs a movement, hands, and pendulum. Ly-Waterbury No.653.